The first step in Camp Nominingue’s staff-training program, our Leaders-in-Training program, provides young men with the opportunity to learn the skills essential to being a leader. More than just a staff-training program, our Leader-in-Training program prepares 16-year old boys to be leaders in any venue and gives them tangible leadership skills they can apply to every facet of their lives. In addition to leadership skills sessions, certification courses and a practicum with younger campers, the boys also take part in an extended canoe trip and solo experience. Each night, the Leaders-in-Training will gather with their counsellors around the campfire to discuss the day’s work and debrief the day. 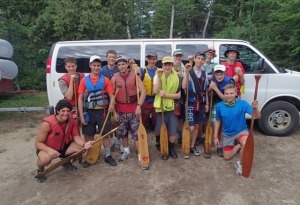 All this contributes to a very busy and intense summer camp schedule for the participants; however, most of the boys find that the busy schedule adds to the fun and excitement of the Leader-in-Training program.